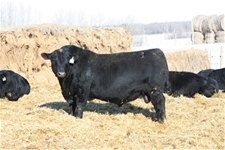 In the fall of 2009 Kolton bought his first group of Angus heifers out of the Reich Ranch herd. Since he was still working full time, he ran his cows on shares with Harold while continuing to help out on the ranch and grow his angus cow herd. 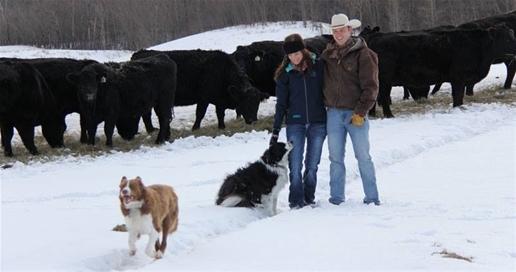 He was looking for options to expand the cattle base and shift more toward working on the farm, when in the spring of 2014 he found a group of Black Simmental cows he was able to purchase. Together with his Angus cows they felt they had enough to make a shift toward more ranching and less off farm employment. That summer Kolton and Bailey began building the K3 Ranch, which they continue build upon and work to expand their cow numbers today. Baileys big passion is horses and she continues to train and trade young barrell with her spare time. We have found the Simmental and Angus cattle compliment each other very well. From birth to sale day, the Simmentals are run on the same program that we have been running our Angus on for years as we feel allowing the bulls to grow easy helps with the longevity of the animals. The bulls are fed side by side and expected to perform to the same standards that we hold the Angus to. We have also began working with some hy-brid crosses and upgrading on the Simmental cattle and are very exited about the products that we are able to offer our ranching customers as a result. If your driving west of Bashaw, stop in for a visit.